Traditionally, as summer moves to fall, many people’s preferences move from grilling to braising and roasting. I confess that even though it was considered seasonally inappropriate, I kept braising and roasting throughout the summer. I blame it on my new favorite kitchen appliance, my Instant Pot (or as my mom refers to it, a “turbo crock-pot”). 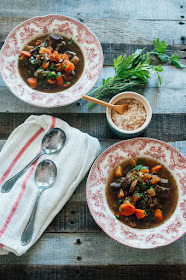 With the help of my Instant Pot I’ve been making this beef stew since July when I originally went back to strict AIP & added a low FODMAP component. 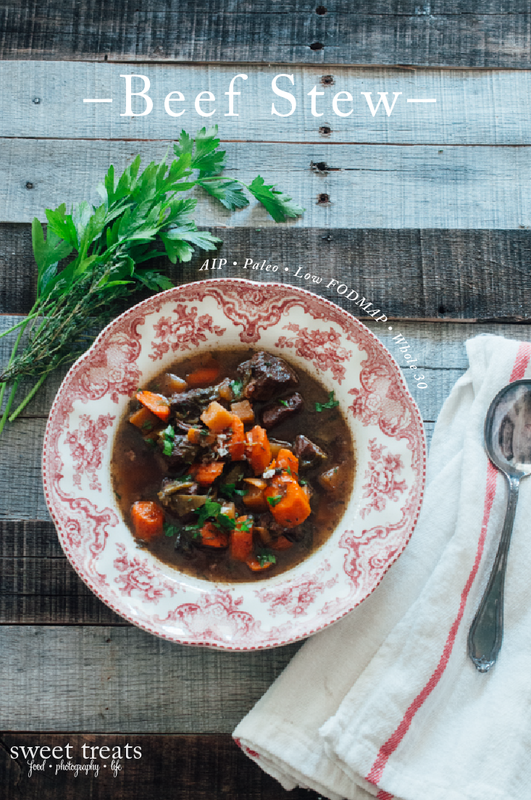 I didn’t know if it was possible to make palatable beef stew without high FODMAP ingredients like onions, shallots, garlic & mushrooms. 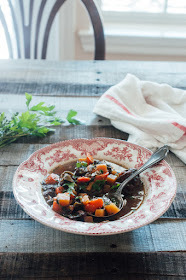 Brainstorming different vegetable options & changing my mindset of what were “necessary” stew ingredients allowed me to create this really phenomenal stew. My preference these days is to make as many things in my Instant Pot , as possible, but since I realize that not everyone may have this particular appliance, I’ve written out stovetop approximations too. One of the other things I appreciate about this recipe is that it is comprised of primarily “staple” ingredients, or ingredients that I generally have on hand all the time. 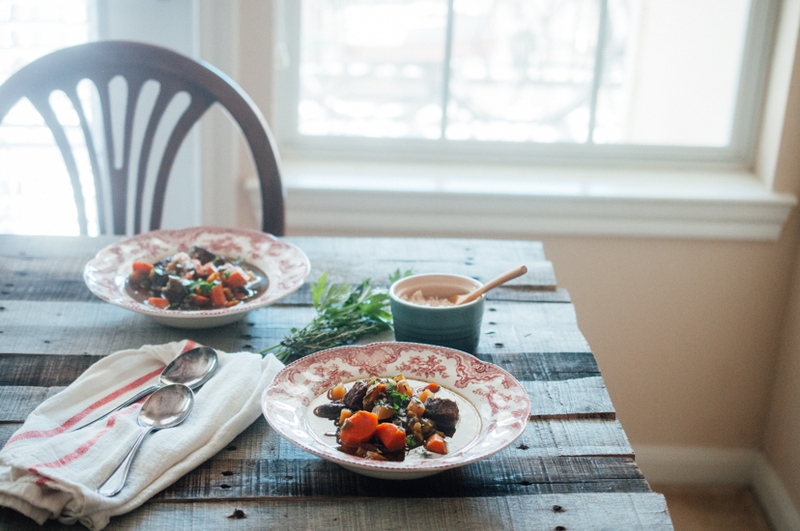 Carrots, and rutabaga are really hearty veggies that keep in the refrigerator for a good amount of time. Leek greens, if stored properly, can also last a while. I keep meat, broth, and bacon in the freezer at all times. And in a pinch, dried herbs can be substituted for fresh ones. 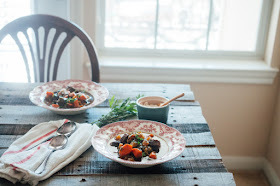 The stew is really great on its own, but if you want to bulk it up further or serve it for a celebratory meal, I also like to serve it over mashed (white) sweet potatoes or squash. And I’ve often added a few spoonfuls of braised greens (I love this recipe from the Paleo Cajun Lady, & usually make it with chopped swiss chard & bacon & omitting the garlic to make it Low FODMAP) to the stew to up the vegetable content. Additionally, the leftovers freeze beautifully & there’s nothing quite like finding a jar of delicious beef stew in your freezer on a day when you’re not in the mood to cook. Note on FODMAPs: FODMAPs are confusing things... Certain resources will say that one item is “ok” and other resources will list that item as “avoid.” I am choosing to get my information about FODMAPs from Monash University & their app. Monash is continually updating their information & they are great about listing what quantity of food (both by volume & by weight) keeps it within the low FODMAP guidelines. As always, though, you know your body best. Just because one list says a food is fine, doesn’t always mean your body will be fine with it. Or on the flip side, just because one list says a food is on the avoid list, doesn’t mean your body is automatically going to be bothered by it. Do what makes your body & mind feel the best. Add the fat to the insert of an Instant Pot . Turn the pot onto “Sauté” & allow the fat to melt. Dry the meat very well. Brown the beef on all sides, in batches, in the sautéing Instant Pot --it usually takes me three batches to brown 2 lbs of stew meat. Remove the browned beef & set aside. Sauté the bacon & leek/scallion greens in the Instant Pot until the bacon begins to crisp & the leeks/scallions begin to wilt. Stir occasionally. Add the carrots & rutabaga, broth, wine, and browned beef. Stir to combine. Tuck the bay leaf & herbs into the mixture. Place the top on the Instant Pot & make sure the vent is closed . Pressure cook using the manual setting for 50 minutes at high heat. Note: the entire process will take longer than 50 minutes because it does take time for the pot to come up to pressure. Once the machine has beeped, allow it to switch to the “keep warm” function or turn completely off for 15 minutes to let the pressure come down a bit. Use a silicone oven mitt or heavy kitchen towel to move the vent from the “sealing” position to the “venting” position. Allow all the steam to escape then it is safe to open the lid. Serve the stew on its own, or along side a starchy vegetable. Adding extra cooked greens is also a great option. Sprinkle with some extra chopped herbs just before serving. Store any leftovers in the refrigerator or freezer. In a large dutch oven, melt the fat over medium high heat. Dry the meat very well. Brown the beef on all sides, in batches if necessary. Remove the browned beef & set aside. Sauté the bacon & leek/scallion greens until the bacon begins to crisp & the leeks/scallions begin to wilt. Stir occasionally. Bring to a simmer, reduce the heat to low, cover & allow to gently cook for 2-4 hours, or until the beef is tender. Making it now! Added extra broth and wine to make it more of a soupy stew. Hopefully it will work out! Really excited by the east of the instructions and ingredients list. Thank you for this! By the way, in regards to leeks, what part of the leaves can we use? I noticed that there's a cylindrical shoot under with the dark green that looks more like the bulb. Is this safe? This isn't Whole30 because of the wine. how long would you cook the stew in a traditional slow cooker? 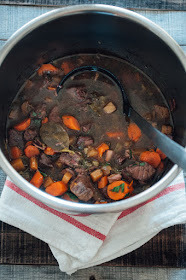 The other 2 lb stew I read said 30 min! Yikes, big range. Any ideas why? I thought the same thing - but when I tried 30 minutes the meat was tough, at 50 minutes it is delicious.